Smith Introduces ZIP Trench™ - Polypropylene Trench Drain - Jay R. Smith MFG Co.
MONTGOMERY, AL—April 27, 2017—Jay R. Smith Mfg. 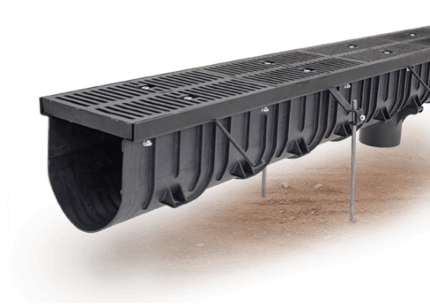 Co. has introduced the newest product in their line of Trench Drain Systems, the Zip-Trench™. The Zip-Trench™ is a 12” wide polypropylene trench drain with a high storage capacity that offers a less expensive, labor saving alternative to cast in place trench drains. The 9’ 10” length of the channels and built-in rebar anchors make installation fast and simple. The polypropylene material is lightweight, recyclable, break-resistant and offers better chemical resistance than polyethylene. It can handle temperatures of 180 degrees. The Zip-Trench™ comes with a choice of coated steel, galvanized steel, or stainless steel frame, which is directly supported by the surrounding concrete when installed, offering added stability. Each rail has alignment clips that keeps your trench drain installation straighter. The Zip-Trench™ has four grate choices with Class C and Class E load rating options. Grates are not required during the installation and the grates remain coplaned during the pour. Applications for the Zip-Trench™ include parking garages, driveways, gas stations, fire stations, breweries and other industrial or commercial locations where there is a high quantity of water being used or where it is desirable to drain wastewater with chemicals that need to be kept out of the sanitary drains.